A comprehensive look at child maltreatment. 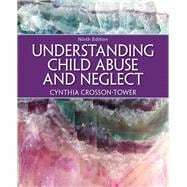 Understanding Child Abuse and Neglect, 9/e provides a comprehensive look at children’s services. This title explains case management procedures and focuses on how various professionals become involved in the child protection process and in turn how treatment is undertaken. This title concludes with an overview of functional and dysfunctional families, and contrasts healthy child development with development hampered by abuse. Be familiar with the full range of services for children from the least intrusive to the mot comprehensive. Understand the effect that various services will have on children and families. Have a sense of what it might be like to serve children in various agency settings. Dr. Cynthia Crosson-Tower is a national expert on child abuse and neglect and the author of numerous books and publications including Understanding Child Abuse and Neglect, Exploring Child Welfare: A Practice Perspective, When Children Are Abused: An Educator’s Guide to Intervention, A Clergy Guide to Child Abuse and Neglect and How Schools Can Combat Child Abuse and Neglect. Dr. Crosson-Tower taught in the Behavioral Sciences Department at Fitchburg State College in Massachusetts for 24 years, also founding and serving as the Director of the Child Protection Institute there. She maintains a private practice, Harvest Counseling and Consultation, specializing in the treatment of survivors of abuse and perpetrators of sexual abuse. Dr. Crosson-Tower served on the subcommittee to develop protocol for the Cardinal’s Commission of the Archdiocese of Boston and became a part of the Implementation and Oversight Committee of the Archdiocese’s Office of Child Advocacy.